There was a time, when we knew what took place after the closing curtains of Return of the Jedi. It might have not always made sense, but it was one heck of a ride. There was no future movies to counter the story until now. Everything has changed. The Force Awakens released a canonical event thirtyish years later on the timeline that restructured what took place in the New Republic. Now, to bridge the old with the new came the Aftermath trilogy. 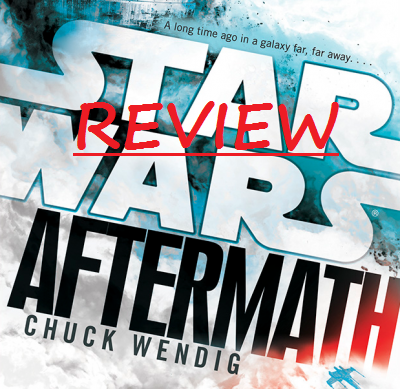 A trilogy of novels by Chuck Wendig that set out to introduce a new cast of characters, and begin to bridge the original trilogy to the sequel trilogy. Below is my review of the first novel. If you are interested in diving into the first year of the New Republic, I wrote up a guide here. What is Going on in the New Republic? “Forget the old way,” Count Vidian first decried in the novel A New Dawn by John Jackson Miller. Something that had carried over to Rae Sloane, who is the antagonist of Aftermath. In the novel she is set out to have a secret Imperial meeting on Akiva to attempt to set the Empire back on course of galactic oppression. Meanwhile, we are introduced to an eclectic band of misfits that later form into Imperial Hunters. In addition, the baby steps of a New Republic is showcased as it stumbles and crawls to become a government worlds actual want to rule over them. A lot of bouncing around takes place in this novel as interludes break up the story to tease events happening throughout the galaxy. In a way it reminded me of the Star Wars Insider short stories. They might not fully connect, with the plot, but are a fun distraction of galaxy building. This novel does center mostly on one planet, in order to build up the new characters as their paths intertwine. In a way, it reminded me of the first season of Star Wars Rebels, where they mostly told stories on Lothal. It worked, for this story, because both sides did not want to bring all out war to that planet. Speaking of new characters, this novel has a lot of them. So many in fact that if the familiar characters were the Death Star, all the new characters would make up Starkiller Base. But don't despair! Even though the story consists of almost all new characters, the story is easy to follow along. Grand Admiral Ackbar: He’s no Admiral Raddus, but plays a big role in the New Republic Navy. Once bitten, twice shy this Mon Calamari is hesitant about overstepping boundaries on worlds still stuck in the tendrils of the Empire. Norra Wexley: Former Y-Wing pilot to the Rebellion, who abandoned her duties as a Mother to join the Rebel Alliance after her rebel husband was kidnapped years ago. Temmin Wexley: Teenage junk dealer and son to Norra. Left on Akiva to pick up the scraps as he works to make a name, for himself on his home planet. Mister Bones: Repurposed B1 Battledroid, eloquent cackler, protector of Temmin, and handsomely designed, with a lean towards the bone wearing variety. Surat Nuat: Sullustan Crime Lord on Akiva, and all around despicable guy. Eclectic office decorator in his spare time. Wedge Antilles: Pilot in the New Republic, who stumbles upon a secret Imperial meeting on Akiva, and dashingly escapes into imprisonment. Sinjir Rath Velus: Former Imperial Loyalty Officer, and continuous connoisseur of the finer life of drinking. This defector of the Empire unsuccessfully escapes Akiva and joins in a mission, with a “former” acquaintance. Jas Emari: Zabrak bounty hunter, who went Imperial head bobbing, and found out she bit off more than she could chew. With stakes raised she must regroup and team up to catch her prey. Admiral Rae Sloane: Admiral of the soon to be fractured Empire, she set out to find a way to stop the leaky pipe of the crumbled Empire from bursting. The voice of reason and one of the best officers in the Empire, she arranged the secret meeting on Akiva. Operator: Mysterious informant to the New Republic. Chuck Wendig did a wonderful job creating a different way to enjoy a story. Wendig wrote the story in third person present tense. This style did not bother me, and I was shocked by the backlash. What works for me is the way the story was written reminds me of watching Bob Ross paint a painting on his TV show. Ross introduces himself, describes in detail all types of colors he plans to use, and digs right into painting. While slashing, stroking, and dabbing the canvas, Ross describes the little things he is doing. Ross may tell a little story of the painting, while repeatedly "beating the devil" out his paintbrush on the side of the isle to dry it. Ross might also sometimes show off some footage of his pet squirrels. In the end, we can see his finished painting, but the joy was in the journey of watching him create. That is how I went into this book. Chuck Wendig is the Bob Ross of Star Wars. We experience the story in the moment, get painted a picture on the canvas, and at times get to see some squirrel footage! In addition, Wendig likes to work against expectations building up one train of thought, and then flipping it on it’s heels. Often it left me cackling in delight. First is Sinjir Rath Velus. He was my favorite of the new cast of characters. His sarcasm and wit plucked at my heartstrings in a way that I did not expect going in. Wendig not only made Sinjir charming, but a successful comic relief, with a resourceful set of skills. I hope we get more stories of him outside the Aftermath trilogy! Second is Rae Sloane. She was fun in A New Dawn, great in “Bottleneck,” wonderful in “Orientation,” and down right amazing in “The Levers of Power!” And now the Aftermath trilogy. I still remember the first excerpt to this novel. I was blown away! Not by Wedge or the statue crumbling on Coruscant, but the continued story of Rae Sloane. The portrayal in this novel such a delight. This part I won’t sugar coat, with space cereal covered in drippy syrup. The style of the Aftermath is vastly different to other novels set during this time in Legends. So different that it may completely go against one’s reality of what Star Wars is. It would be unfair to dismiss your perceptions, and it is okay not to like this story. For example, here is an example of someone not enjoying Rogue One. Art is neither wrong or right, and I would not want to gate keep anyone. However, I do fully recommend this story! It is wonderful to paint a different picture. It is okay to have a story reshape other existing stories. In the original trilogy we were shown a different side of Darth Vader and Obi-Wan Kenobi in Return of the Jedi that completely changed how we viewed them in A New Hope. In the end, I had a blast, with this novel. The chaos of the New Republic struggling to rebuild as the fractured Empire desperately grasps to hold on by the tips of it’s fingers. The interludes offer much world building, and teases at events to come in both the other Aftermath novels and future canon stories. If possible, I recommend the audiobook version as it enhanced my experience. The downside was the scale of the first novel was small, and had to deal, with an origins story. However, I think it holds much weight to be an awesome Star Wars tale!